The bitching’s back in a star-studly revival of Mart Crowley’s closet-breaking 1968 drama. To some degree, at least, we seem to have learned. 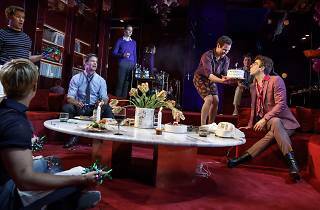 The keen-edged and engrossing 50th-anniversary revival of The Boys in the Band—which is also the play’s Broadway debut—is the creation of five openly gay producers, an openly gay director (the redoubtable Joe Mantello) and nine openly gay actors. No one seems worried about being role models; they focus on their roles, and on Crowley’s flavorful dialogue, whose basic bitterness is frequently cut with acid. Jim Parsons is Michael, the host of the party and the play’s unstable core: anxious about aging, deeply in debt, trying not to fall back into drinking. The birthday boy is the imperiously weird former figure skater Harold (the icy Zachary Quinto), Michael’s frenemy and nemesis; the wildly nelly Emory (Robin de Jesús, ebullient and vibrant) has bought him a dim but beautiful hustler (Charlie Carver) as a gift. Also in attendance are Donald (Matt Bomer), Michael’s best friend and sounding board; Hank (Tuc Watkins ) and Larry (the effortless Andrew Rannells), a couple with differing notions of fidelity; and the even-keeled Bernard (Michael Benjamin Walker), who manages his African-American identity carefully. The basic structure of the play is familiar. It’s like Albee, but campier and less literary: Who’s Afraid of Virginia Mayo. But it has mostly aged well: It has resonance and snap. While the star casting is not completely effective—Quinto is too knowingly attractive to play Harold (the self-described “ugly, pockmarked Jew fairy”), and Bomer’s marble-god physique seems wrong for the bookish Donald—the cast meshes convincingly, and there are many fine, small moments. (On the phone with someone from his past, for example, Bernard touchingly reverts to a former way of speaking.) And Parsons, in the most difficult role, offers a searing portrait of self-loathing that defies us to confine it to the comfort of a period piece. 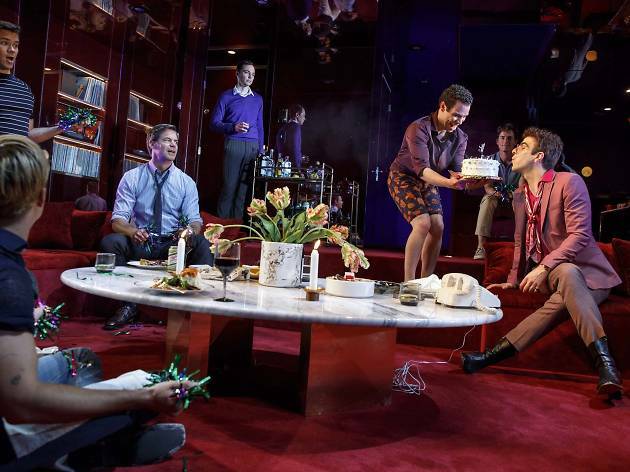 At its most effective, Mantello’s The Boys in the Band moves beyond the gay past and stares the present straight in the face. We are all in the gutter, but some of us are looking at the mirror. Booth Theatre (Broadway). By Mart Crowley. Directed by Joe Mantello. With Jim Parsons, Zachary Quinto, Matt Bomer, Andrew Rannells, Robin de Jesús. Running time: 1hr 50mins. No intermission.